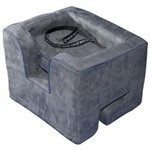 Pet Car Seats, Pet Strollers, Dog Goggles, Pet Ramps and Pet Steps :: Shop.QBased.com :: Keep your pet's joints and back healthy by using pet ramps or pet steps. Drivers do not think twice about fastening their own seat belts, or placing their children in a car seat or booster seat, but very few drivers use seat belts for dogs while riding in their car. Thousands of dogs are injured in car accidents every year because their owners fail to realize an unrestrained dogs face the same risks as an unrestrained human if you are in a car accident. There are also many cases where an unrestrained pet can actually cause a car accident. This is just one more reason to invest in a dog car seat or a doggy car booster seat. In addition to booster seats and seat belts for dogs, there are a few other devices which can be used to keep your pets safe during a car ride. The best pet car restraint system depends on the type of pet you have, the type of car and your pet's needs during the car ride. There is such a thing as goggles for dogs which are also known as doggles, these fashion statements look like swimming goggles and or the classic aviator glasses. Doggles usually feature an adjustable strap with a foam cushioned lenses. This helps to prevent the eyewear from blowing off every time your dog leans its head out the car window or from shaking and moving around. The doggles also provide your pet's eyes with 100% UV protection. 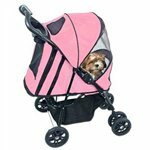 Some pet owners use pet strollers as a way to pamper their beloved pet and other have a legitimate reasons for using a stroller for their animals. If you have a cat and you live in an area where you cannot just let it run around outside, you do not have a lot of ways to let them enjoy the outdoors. Cats do not walk well on leashes. If you have ever tried to leash train a cat, you probably still have the scars to prove it. Another option is to put a harness on your cat and then just carry it. If it jumped, it would not be able to get far because of the harness holding it. That would be a safe way to do it, but you would still be stuck carrying the cat around with you. If you do not want to carry your cat or you cannot carry it, a stroller for your pet is an alternative. Some cats and dogs just cannot walk long distances either because of arthritis or their age or they have some other kind of physical disability that will not allow them. Just because your animal cannot walk well, does not mean it does not mean you cannot take your dog or cat for a walk. If your dog or cat has physical limitations, an animal stroller can make the difference between a pleasant walk through the park or just never being able to leave the house. Even healthy dogs are not dismissed from getting joint or spinal injuries from jumping. In fact, many of those breeds which have long spines, short legs, overweight bodies or sensitive bones are at higher risk for these injuries. Pet ramps and stairs are usually cushy and will help keep joint impact to a minimum, because there is no longer a need to jump. This accessory can also help reduce the chance of your dog or cat developing laziness as an alternative to jumping that is painful. Pet stairs and ramps prevent injuries, promotes healing and reduces jumping. They are also washable, so you do not have to replace them after just a few uses. Rottweilers and or Pit bulls are more prone to hip dydpasia and dogs or ramps can help to make is easier for them to move around the house without hurting themselves. They can also helps dogs who are prone to joint problems, arthritis, bone wobblers syndrome, osteopathy, diabetes and many other health issues.